Dear Kimmy-Recently, I finished a quilt which looked okay while I was working on it. However, when I took it off the frame I noticed that my sashing strips and some of the seam lines were very wavy. I’m a beginner and I know I shouldn’t expect miracles, but this looks really bad. What did I do wrong and how can I prevent this from happening again? Kimmy says-Don’t be too hard on yourself; we’ve all done this! Wavy lines are a very common flaw among quilts finished by beginning (and sometimes not-so-beginning!) quilters and, fortunately, the fix is quite simple. The key is to start by loading the quilt straight and then focus on keeping it that way as you work your way through the quilt, paying close attention to the lines of the quilt so that they don’t become distorted as you go. Distortion can be caused by several different things; perhaps the fabric was cut or pieced improperly so the line was never very straight in the first place, perhaps there is excess fullness in the block which caused the piecing lines to migrate and become crooked, or perhaps the lines were straight to begin with but have been pulled out of place by dense quilting. These issues can all be solved by careful stabilization work during the quilting process, enabling you to end up with a quilt that has a crisp and professional finish. The real bonus is that the steps needed to complete this stabilization work are quick, easy and very achievable! Once you’ve loaded the quilt and have ensured that your top edge is straight and the corners are square, it’s time to work on the framework of the quilt. (my instructions for proper loading can be found in the March 2011 issue of this magazine.) Let’s view the quilt as a house for a moment. The foundation of our quilty house is formed by a nice straight on-grain backing which will help to support everything that is built on top of it; in this case, the quilt’s batting (which does not have much stability of its own) and the quilt top (which is made from many different pieces of fabric, some of which may have been cut on the bias, or may have been warped by aggressive ironing, thus compromising their stability and altering the way they affect the finished block) The batting and top wouldn’t have much chance of turning out straight if quilted together on their own, but the foundational stability provided by the backing will help hold them in line and prevent them from drooping and sagging, just like the foundation of a house holds up everything that comes next. Now, let’s look at what’s built on top of our foundation. 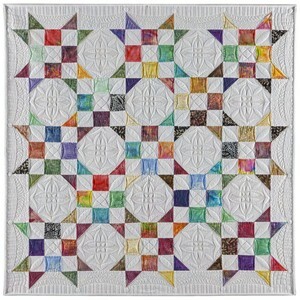 Again viewing the quilt as a house, we can see that the seam lines which connect the borders to the interior of the quilt, the sashing strips to the blocks, and the rows to one another are much like the solid wooden framework of a house. Obviously, if the framework in your house is crooked your rooms won’t be very straight. You’ll have floors that tilt from one corner of the room to the other, your roof will look like a ski slope, and when you set your coffee cup on one end of the countertop it will go sliding right off the other end and land on the cat. 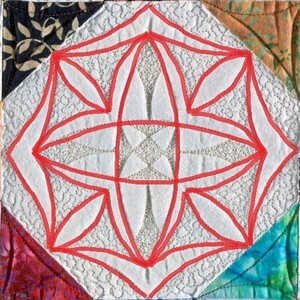 The same thing will happen if your seam lines aren’t kept straight during the quilting process; that framework of seam lines which should work together to keep your blocks square, your sashing strips pencil-straight, and your borders flat and crisp will instead allow blocks to droop, sashing strips to sag, and borders to appear wavy. The solution to this problem? Easy! With each new advance of the quilt, simply take a few moments to ensure that all of your lines are in place before you begin to quilt. When doing custom work, the process is similar in that you will still straighten your lines before quilting. The difference is that you will now take the time to stabilize the lines before you start doing any dense design work that might distort them. Because custom work generally involves denser quilting than edge to edge work, and denser quilting can cause more distortion than loose quilting does, it’s important to nail the lines down first before you go hog wild on your quilting. Stabilization work includes stitch in the ditch, continuous curve, motifs that are not dense enough to adversely affect the rest of the block, etc., basically any type of quilting that is not so dense that it will shift or move the surrounding fabric and cause warping of the lines. Here’s how you do it; as previously discussed, straighten all of the lines in your work area, paying careful attention to the highly visible lines that form the skeleton of your quilt. Distribute fullness properly and arrange the piecing lines within the blocks so that the blocks are laying flat and true. If you are going to stitch in the ditch (SID) do so now, before doing any design work that could cause things to shift. Now it’s time to stabilize the block itself and work through the rest of the quilting plan. 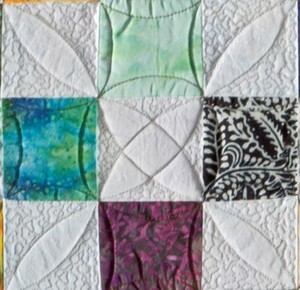 Using this example Photo B of a simple custom quilting job that could be easily accomplished by a confident beginner, let’s go step by step through the process. I then went back in and did my template work, creating the X-shaped melon designs (minus the meandering) in the nine patch blocks Photo D (which are very loose designs and will not shift or warp my blocks), and the more complex designs in the snowball blocks. Please note; when doing these more complex designs, I did not execute the entire design on my first pass because to do so would have been too much quilting and I would have risked distortion. Instead, I did only the skeleton of the design on this pass Photo E and left the dense fill-in work for later. At the ends of each row, I used my templates to create the swag design and the piano key design (minus the filler work and meandering) to create the look of a border for this borderless quilt. Advancing the quilt, I repeated this process for all of the rows. When I was finished with this stabilization work I went back through the quilt, completing the denser quilting in the center of the snowball block designs and doing the easy meandering that squashed out the fullness and finished the quilt. The end result was a quilt that possessed the appearance of well pieced patchwork , no fullness, and a subtle border, all of which was framed by a grid of straight seam lines. This method of ‘back and forth’ quilting may seem time consuming at first glance, but in reality it takes no longer to execute the design work than it would if you were to do it all in one pass and it yields dramatically superior results. In my own experience, I have found it to have worked wonders on ‘challenging’ quilts, allowing me to create the illusion of beautiful and precise piecing on tops that initially looked like they’d been run over by a dump truck at some point during the piecing process. 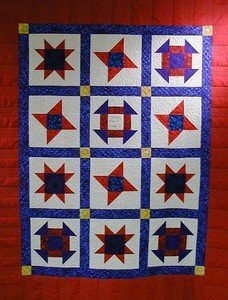 Give it a try and prepare to be amazed at how crisp and true your finished quilts look!